Roaming is a convenient service that allows you to enjoy most of the features and services available on your mobile device while you are travelling overseas. Roaming is considered a premium service and as a result it is billed at higher rates than you would normally pay for mobile voice and data services such as email, social networking and web browsing at home. Here are some steps you can take to reduce your roaming costs while still enjoying the ease and convenience of using your mobile while you are travelling. FACT: Voice, SMS/text messaging and data services including WhatsApp, Blackberry Messenger, Internet Browsing, Instant messaging, MMS and accessing email, which are covered by your regular calling plan at home may attract additional charges abroad. TIP: If you purchase one of FLOW's MyRoaming plans which are available for the USA, Canada and UK, all incoming calls are free which will not result in a charge. If you have not chosen a MyRoaming plan and you do not wish to be charged for voicemail, then call our Customer Care Centre before you travel and temporarily disable your voicemail service. Once you return home, you can call the Customer Care Centre and have your voicemail reactivated. You can also use your Caller ID to monitor and screen incoming calls and you can opt to answer on an as-needed basis. FACT: Smartphones (i.e. Blackberry devices, iPhones, Android devices etc.) can cause an increase in your roaming charges because even when you think they are idle, these devices can actually be transferring high volumes of data by downloading incoming email, receiving instant messages and updating your news and social network feeds, among other things. TIP 1: You can disable your data connection before you travel (see instructions above) and once you are overseas, use WiFi hotspots to access data services on your smartphone. To ensure that your phone is WiFi enabled, go to your connections menu, select the WiFi option and select "on". While using WIFI please ensure BOTH mobile data and international roaming is disabled. 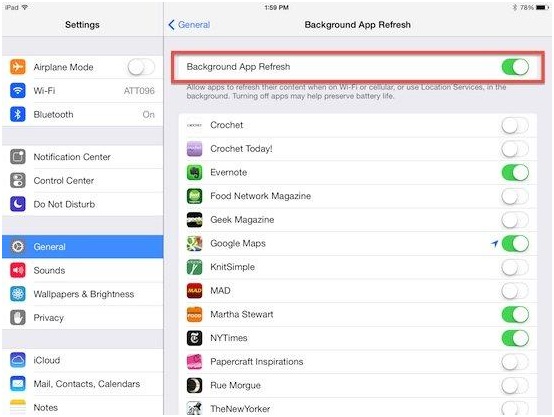 IOS users can turn background data on or off from the settings. In order to do this, just run over "Settings", then tap the "Cellular" icon. Here, you can turn on or off the 3G/4G LTE or Data Roaming functions, and if you swipe to the bottom of the screen, you will see a list of apps that usually connect to cell data.